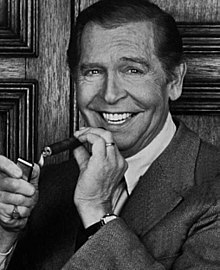 Mendel Berlinger, better known as Milton Berle, (July 12, 1908 – March 27, 2002) was an American actor and comedian. Berle was born Mendel Berlinger in Manhattan, New York City. He was raised Jewish. Berle studied at Professional Children's School. His career began in 1914, when he was 5 years old. Berle first appeared in the serial The Perils of Pauline. During his career he starred in numerous movies, television programs and others. He was called Uncle Miltie during TV's golden age days. He was known for hosting Texaco Star Theater (1948–55). In 1949, Berle hosted the first ever telethon. Berle retired in 2000 because of poor health. His last appearance was in a 2000 episode of Kenan & Kel. Berle was married to Joyce Mathews from 1941 until they divorced in 1947. They remarried in 1949 only to divorce once again in 1950. Then he married Ruth Cosgrove Rosenthal from 1953 until her death in 1989. Then he married Lorna Adams in 1991. Their marriage would last until his death in 2002. Berle had three children. Berle died from colon cancer in Los Angeles, California on March 27, 2002 at age 93. He was buried at Hillside Memorial Park Cemetery. ↑ Breslin, Jimmy (1991). Damon Runyon—a life. New York, USA: Ticknor & Fields. ↑ "Milton Berle, 'Mr. Television,' Dies at 93". Washington Post. March 28, 2002. Retrieved 2009-01-27. Milton Berle, 93, the old-time vaudeville comic who earned the nickname "Mr. Television" for introducing millions of Americans to the electronic medium during its infancy and thereby helping to change the country forever, died yesterday at his home in Los Angeles. Berle, who had been under hospice care in recent weeks, learned last year that he had colon cancer, the Associated Press reported. ↑ "'Mr. Television,' Milton Berle, dead at 93". CNN. March 28, 2002. Retrieved 2009-01-27. Berle, who had been in failing health in recent years, died in his sleep while taking a nap, publicist Roger Neale said. His wife, Lorna, was at home with him when he died. Berle is also survived by two sons and a daughter. Funeral arrangements are pending. Wikimedia Commons has media related to Milton Berle.